The #1 this year was not difficult for me; The Cabinet of Dr. Caligari is not a musty old film classic but a truly unnerving and gripping experience (especially when seen in a restored print, as has been possible in recent years). 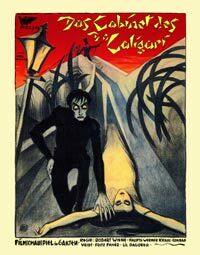 A great flowering of German Expressionism, but a very exotic, death-scented blossom, Caligari presents a world in which everything is distorted and intense, and where people are under the sway of hypnosis or madness. A handy description of going to the movies, which makes Caligari one of the great reminders that movies can be mirrors. A funhouse mirror? Maybe, maybe not so much. The runner-up is one of D.W. Griffith’s big ones, a large canvas that allows Griffith to flex his considerable muscles in the arenas of melodrama and suspense. Some of my other faves are movies from directors who are not necessarily visionaries or great stylists, but who managed to make striking star vehicles (Lon Chaney, in The Penalty) or unusual stand-alone landmarks. In the latter category is Within Our Gates, an early feature by Oscar Micheaux, the pioneering African-American director. Micheaux would later adopt cheapjack work habits to get his projects made, and the films suffered accordingly, but this one is a remarkable “outsider” movie that takes a scathing look at various aspects of race (there are a couple of Uncle Tom characters who receive just desserts) and has a rich aura of folk art about it. The Shipman picture is a wacky advertisment for a car, but it has a dizzy pleasure to it. And Chaney goes all the way in The Penalty, a truly perverse exercise in sado-masochism. Perhaps an equally definitive actor’s picture is The Mark of Zorro (Fred Niblo), a Douglas Fairbanks vehicle. Lubitsch also did Sumurun, a lavish hothouse Arabian Nights thing in which Lubitsch himself plays an important role. I have a 1919 list posted too, but that’s about as far back as I can go without making a more devoted survey of Teens cinema – maybe someday. So after beginning these lists at the start of 2009, I can call it a day after next week, the final installment in the “Year by Year Best Movies” haul (although I will officially add the ’09 and ’10 lists and who-knows-how-many-more later). And then I’ll have a different Crop Duster offering on Sundays, just to mix up the format. I called your top 2 this time. But what else could they be? One of the Buster Keaton shorts, maybe, but Keaton did better later. Caligari and Way Down East are not only iconic and artistic landmarks but immensely entertaining. Knock-outs to look at, too. I like The Mark of Zorro a lot too, and one other pulp adventure classic, the John Barrymore version of Dr. Jekyll and Mr. Hyde. Both films would be bettered in the sound era but not replaced. I hoped that the Buster Keaton film might be on one of the Kino discs but it is not listed. Do you know whether it is available on DVD? One Week is listed as included on the KINO disc of The Saphead, Richard.